The event was held on the Alliant Energy campus and open to the public, though visitors primarily came from the surrounding office park. A local Nissan, Chevy, Ford, and BMW dealership sent vehicle for test rides/drives, as did a local electric bike retailer, electric scooter retailer, and a representative from Zero motorcycles. In addition, six EV drivers traveled to the event, which took place over the course of four hours to allow visitors to participate before, during, and after their lunch breaks. Representatives from the Midwest Renewable Energy Association, Wisconsin Clean Cities, and ChargePoint had booths at the event, and ABB sent materials to distribute. Attendance and participation were steady throughout the four hours, with the vehicles almost always out on test rides. Did you know there are EV cars on the road today that can go more than 200 miles on a single charge? Average electricity cost for an EV is 4 cents/mile as compared to 12 cents/mile for gasoline? EVs have zero tailpipe emissions? 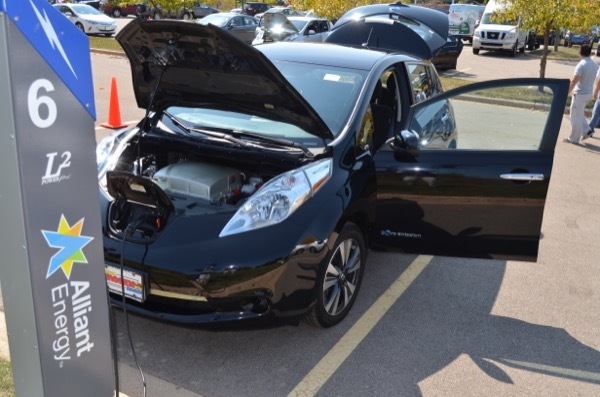 Learn all the reasons these vehicles are growing in popularity, meet EV drivers, and experience the technology yourself at this Ride and Drive Event on Sept. 14 at the Alliant Energy Office Park. It's a free community event with lots to see and do. Registered attendees report 44,723 electric miles driven.